So far 2017 has been very busy for the XP team, the new products have been released along with 3 new video’s. The MI-6 probe and white HF 9″ coil have been a great success we will be releasing the HF Elliptical coil hopefully next month. We would like to thank everyone for their patience. Very soon they will be translated into French and possibly other languages. The MI-6 pin point probe, menu and functions. The HF coils tech talk and demonstrations. The Version 4 update, information and new features. 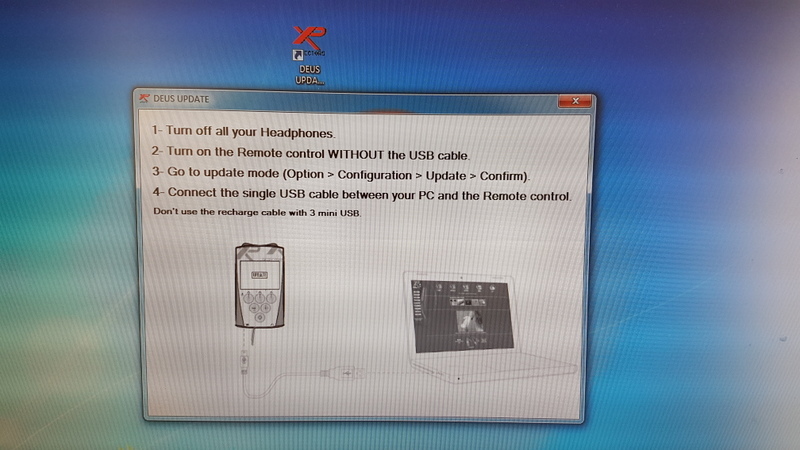 Please note the updates are for a Windows PC only, make sure you understand the procedure and your headphones are switched off before the update, it is very important to use the correct data lead and not the 3 way charging lead. Team Rainbow has sent in a fantastic three-part story to our blog, showing some truly amazing finds made with the XP Deus. Thanks to Kristen Nedergaard Dreiø for his fantastic work. Part I : Viking Gold and oath rings. Part II and III : The story unfolds. Martin is having great success on the beaches with his Deus operating a voluntary lost item service and has found over 53 lost wedding rings this year alone. 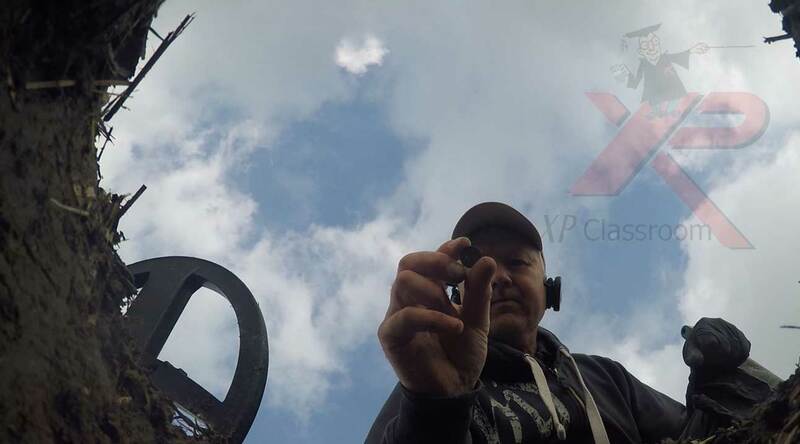 Martin has written a beach hunting article for the XP Classroom blog. Searching dry sand techniques with the XP Deus. I have been using the Deus V4 and the High Frequency coil in a Louisiana Cane field with a program I set up for these conditions and it performed very well. The ground was extremely dry and hard but the new combination worked admirably. Flat buttons, bullets, suspender clips, Spencer casing and even part of a clipped corner CS plate. 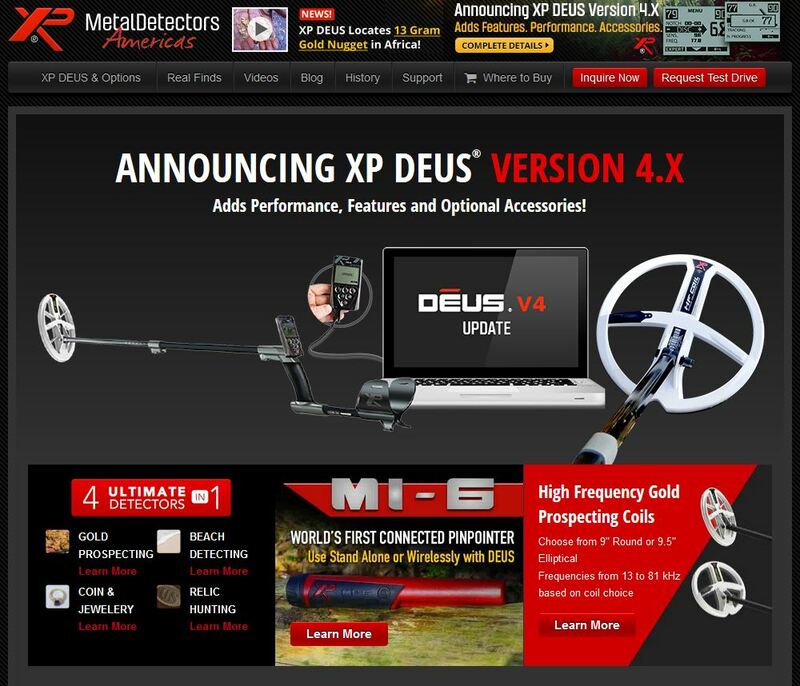 XP Deus V4 and HF coil talk from the USA. Just a quick message to say thank you to Team XP. I watched your XP classroom video on swing technique focusing on slowing down, and also your article about psychologically approaching a massive field in a different way by searching a small square at a time. Now my finds rate has increased dramatically. 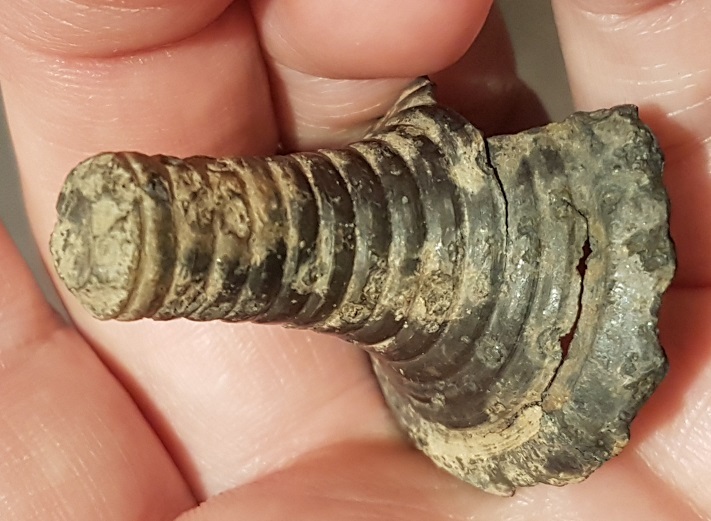 Finding 3 hammered coins in three days, my first spindle whorl, buckets of interesting bits and now this fantastic Bronze age socketed axe which I’m taking to the museum on Saturday. My Deus V4 dry beach hunting Tips. My name is Martin van Hees. 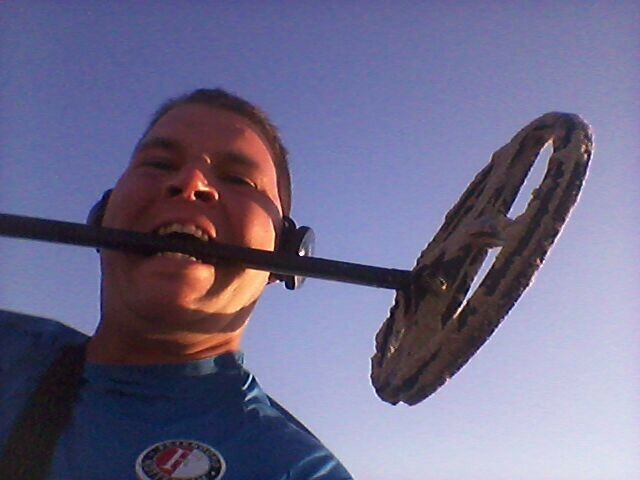 I search with many different metal detectors, on land and dry sand I prefer to use the XP Deus. I use my detector almost every day and offer a free lost property recovery service. People contact me if they have lost something on the beach or nearby parks. Now our group has expanded to 29 people in the Netherlands. 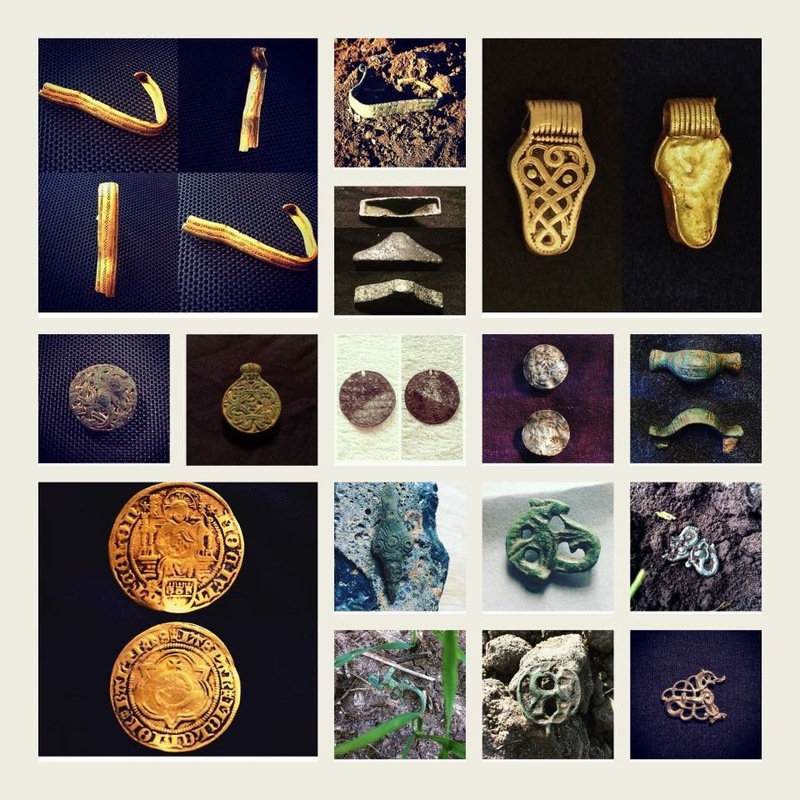 By using a great networks of detectorists we have been privileged to search all over the world. This year alone we have already recovered over 53 wedding rings. But we can only successfully do this by knowing how our metal detectors work. I truly believe in this modern world of technology most of us don’t learn by reading, you learn by trying, testing and keeping the faith. Every fail is a lesson, and it brings you to many victory’s. The XP DEUS is a magnificent machine and can be easily adapted with a little understanding. My personal record is 7 rings in one Day with the XP Deus. Not just beach hunting, I have had some great days searching inland for ancient coins and artefacts too. Before I start to search for lost items on a dry beach there are some things I need to know. Is detecting permitted in the area. What do I hope to find. 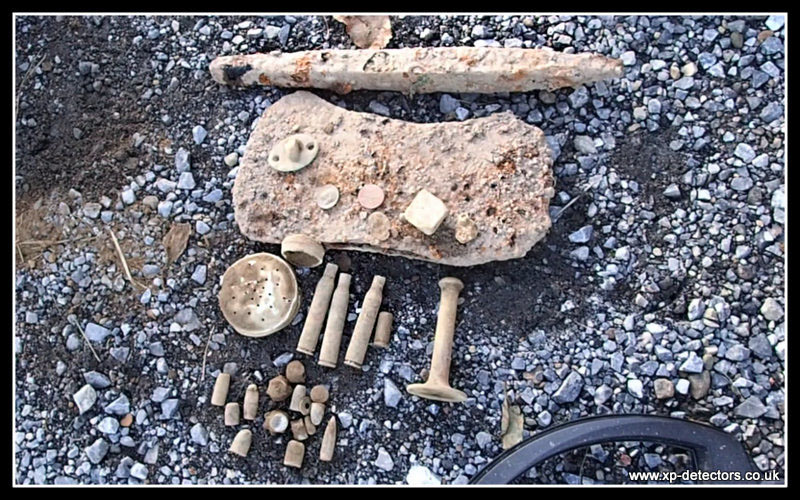 What material am I looking for Gold and Silver is the answer in most cases when beach hunting. How big or small is the area. What are the ground conditions. How did the person lose the item. When did the person lose the item. What machine is best for the job. Is detecting permitted in the area? Yes it is, remember to put all the trash you find into a bag and drop it in a garbage can. What do I need to find? A lost ring, (you can notch to filter). What material am I looking for? Big Silver, (so we can discriminate out a lot of unwanted targets). Try to see if you can get a similar ring to compare the sound and see the TID numbers. How big or small is the area? If the area is big (don’t go on a wide search , go for small plots at a time). 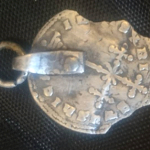 Beach, salt, lots of iron, foil, caps, pull tabs. So try to discriminate, use notch and go for the XY screen (will explain later). When did the person lose the item ? 4 days ago, why is this important you might think. If the person lost it a long time ago the tide may have moved it, so the search area will be bigger. It may possibly be deeper in the sand, and trash can be on top of it. What set up will I use? On a dry beach with a lot of trash I think the XP Deus is my best option as it has a quick recovery and a lot of features I can use to my advantage. I will use a ws4 headset for privacy. To dig I will use my home made beach scoop. A beach scoop is much easier to use and saves a lot of time. I will start by using a basic program and will introduce some changes, I will explain why. When I go on a mission I am always aware of changing ground conditions and sometimes have to change settings regularly. Most days I start with basic program 8 (dry beach). Reactivity 2 or 2.5 so I can just swing a little faster, I am assuming the object won’t be deep, the Deus should give a solid sound and a confident XY when I go over the target. Discrimination 6.8 – I search a lot with this discrimination setting, it still gives good signals on the higher conductors which are often underneath iron. My personal experience is that when you discriminate too much it is so easy to miss good targets, especially thin Gold Jewellery. Frequency 11Khz, this is just a setting I prefer. Audio response 2 or sometimes even 3. It is not that it will go deeper, but it is the audio sound level I prefer. Sensitivity normally 88 as this will reduce most interference. Sounds I use Full Tones, so I can hear all the different targets, most are very close together on a busy beach. XY screen ( I love this new addition to V4) it is a oscilloscope display. Options, configurations, profile +/- XY more information here XP classroom. The big advantage of the XY screen for me is to eliminate bad targets, because I know what target type I am looking for. I don’t start with notch, but when the ground is heavily contaminated I find it can save a lot of time. 0 to 30 to skip iron, and 65 to 69 to skip pull-tabs BUT!! You can lose small gold by using the Notch so remember it really helps to know what target range you are looking for. Try to make the job as easy as possible, a grid system is the best method. I search horizontally and after I cross it vertically. By using this method you know for sure everything is covered. If you walk just walk around with no idea sure you can find it, but the chances you will miss it are also very high. How do I divide the grids? That depends on the place you search. In some cases it is easy I just make piles of sand around the area to be searched. You can also use flags or markers, I keep them in my car as a part of my kit. Bingo 45 minutes into my search the lost Silver ring is found, another XP success story. Before updating your Deus please take some time and make sure you have all the items ready. 1. Ensure your coil RC and headphones are charged and switched off. 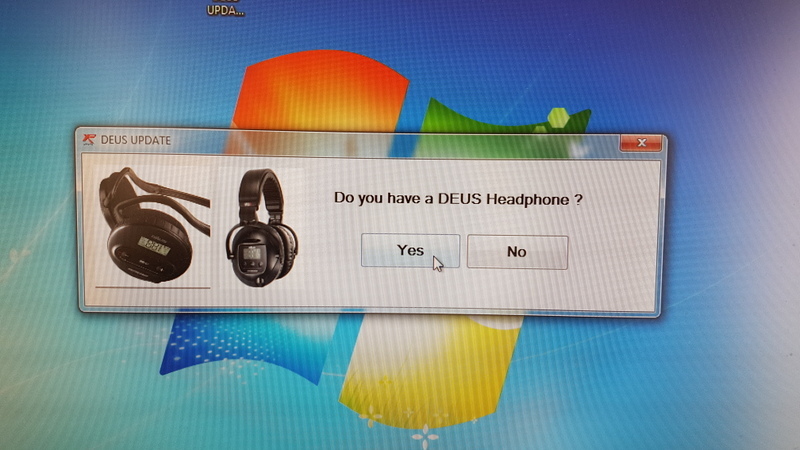 Make sure every other Deus in the area is also switched off, including headphones. 4. Ensure you have the correct update lead, this is a single lead supplied with your Deus and NOT the 3-way charging lead. 5. Ensure your coil numbers are all paired with the Deus and all coils not used are removed from the menu. Double click the folder and the file will start to install. Allow it to place a shortcut on your desktop (sometimes you may want to disable your anti-virus). Here are the questions you will be asked during the update so be ready for them. Plug in your USB lead. 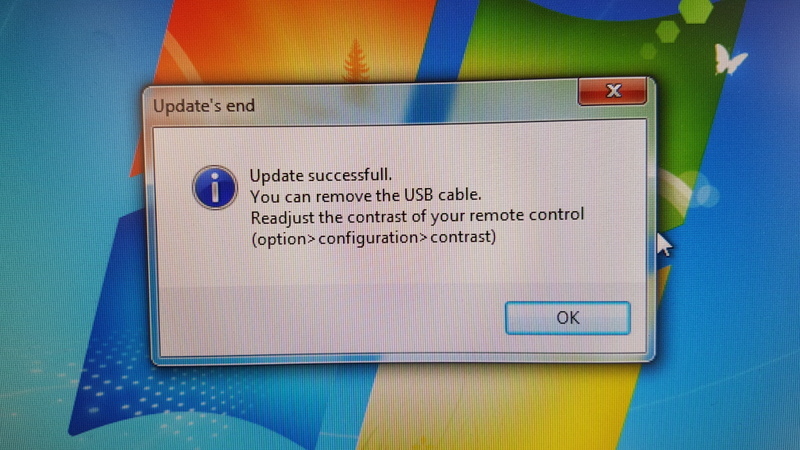 Unplug your USB lead…. then plug it in again. Do you have headphones Yes or No. Do you have another set of headphones if Yes turn off set 1 ( EVEN THEY STILL SAY “UP” ON THE DISPLAY ) Once they are off then turn on set 2. First of all write down your favourite programs as these will be removed during the update procedure. We highly recommend that you uninstall older versions of the XP software from your PC before downloading and installing the new link. 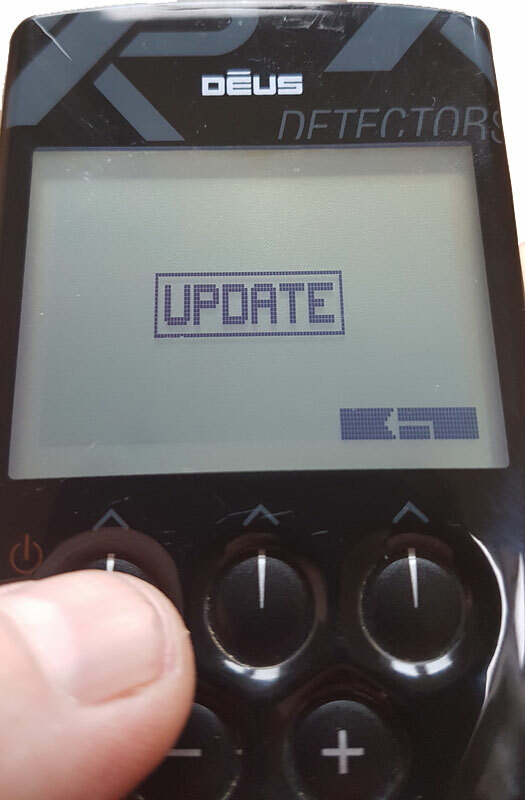 Run the update on your pc, YOU WILL SEE THIS SCREEN. 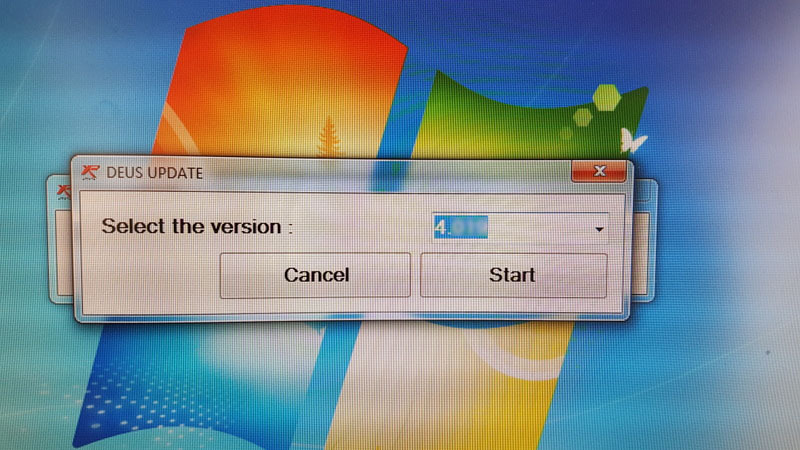 Select which version you require from the drop down menu. 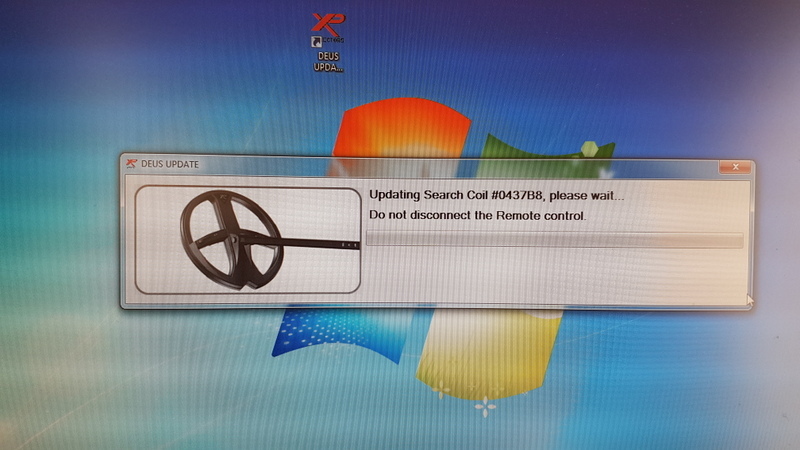 Turn on your Deus WITHOUT THE USB ATTACHED and go to Configuration – Update – Confirm – Yes ….. so you have this screen. 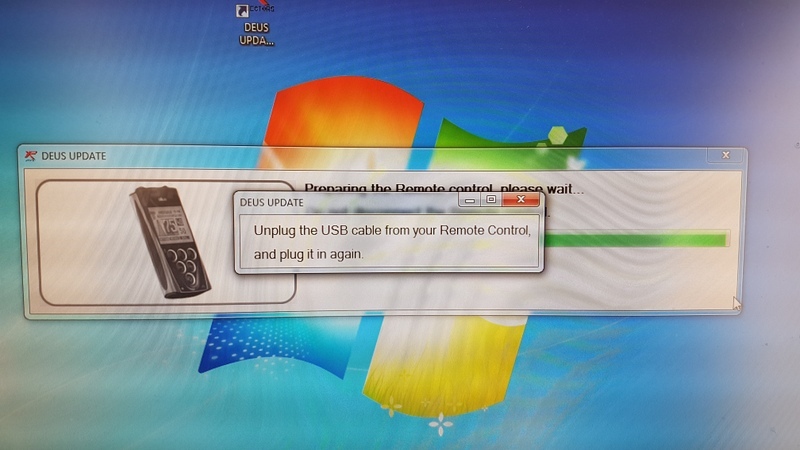 Now plug in the single USB cable from the PC to your Deus, the update should now start. The update will start to run, after a short while it will tell you to unplug the cable and plug it in again – Follow this instruction. 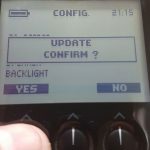 The next step is to update the search coils, the software will update every coil logged into your coil menu, so please ensure any coil you do not use is removed prior to update for a fast install. Once the coils have been updated the update will automatically move to the headphones, select YES if you have headphones and turn them on (Leave the USB cable in the controller do not touch it or turn it off). 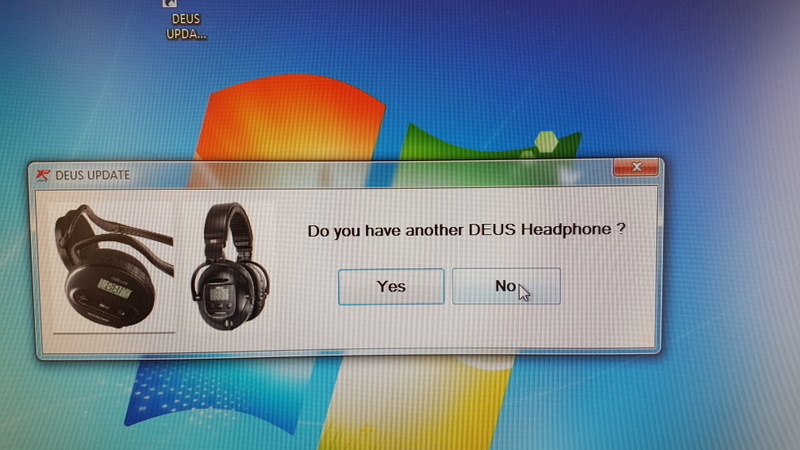 Once the headphones are updated it will ask if you have any more headphones. If the answer is Yes then it is important to turn off the first headphones before proceeding to the second set of headphones (If you own them). Click NO if you do not have a second set of headphones. Once the headphones have updated you will have a message to say all is well and you can now unplug the cable. Your XP Deus will now restart. The average time for an update is around 3 minutes depending on how many items are paired. 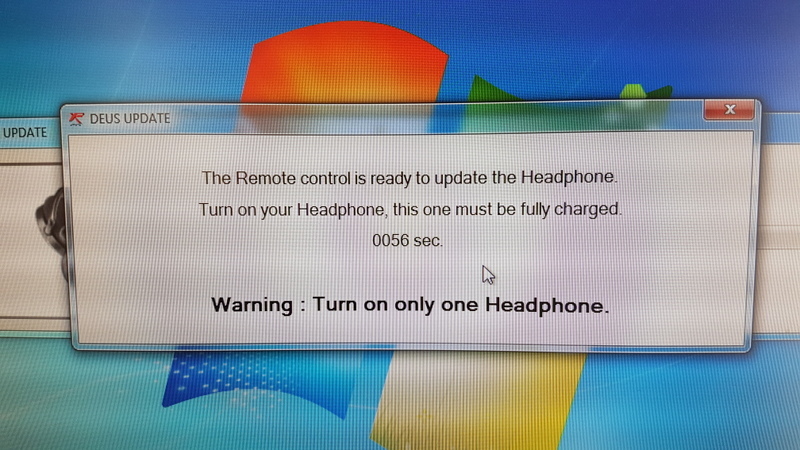 Please note : You cannot update the headphones only, an RC is required. MAC operators : Some people say updates are possible on Macs. 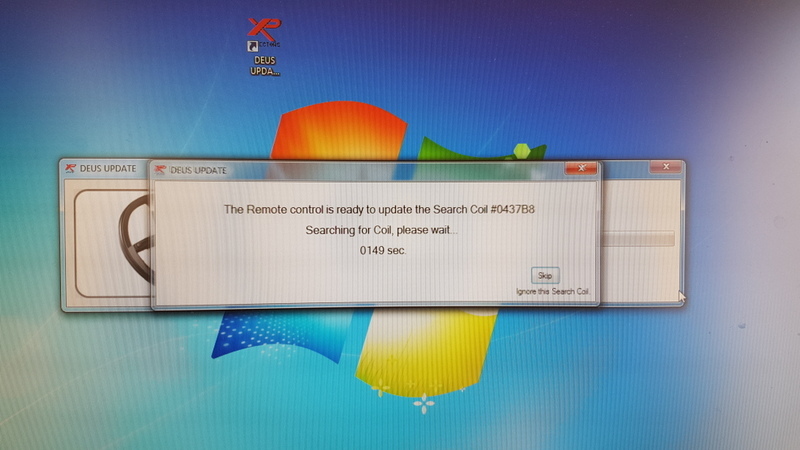 Via VMWare – An app or via Boot Camp. XP cannot guarantee this procedure, therefore XP accept no liability for any problem caused by an unauthorised MAC update. XP have made several changes to the version 4 free update, some things are very obvious, others you have to dig a little deeper to find, so here is a list of the most important additions and changes. Reactivity 2.5, this new reactivity level is fast and deep, offering a good compromise especially when searching new terrain. Program No10 GOLD FIELD : Improved Audio Response and reactivity. 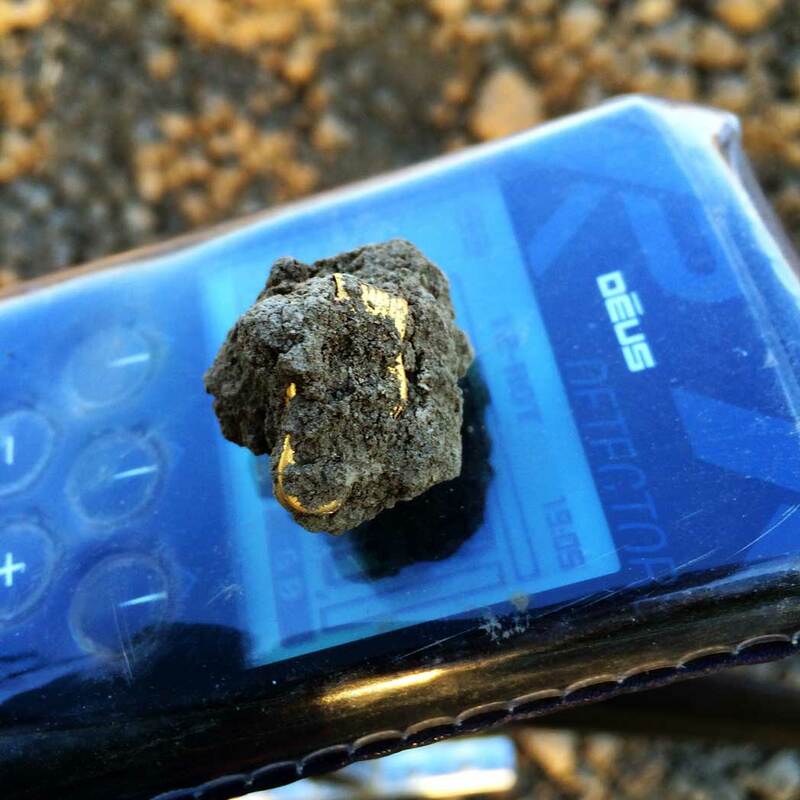 Goldfield will give excellent results especially when combined with the new HF coils…Now difficult targets can easily be detected in mineralized ground.. The Tone menu has been removed. Lower discrimination range : For those who want more control over ferrous targets. Negative discrimination of 0 to -6.4 makes it possible to locate previously rejected ferrous items, the lower discrimination range can also enhance the signature from deep targets which may have in the past been ignored. These new options also offer a big advantage when searching for specific targets such as ceramics or even meteorites. Ground Effects: Improved Tracking / Each frequency adjusts to its own ground effect value. Improved display and signal processing compatible with the new HF 21 frequencies. The display now has the ability to handle detection frequencies up to 80kHz (18kHz before), now with 7 frequency offsets (compared to 3 previously). DEUS is now compatible with a smart phone: Target information and other data can be sent by radio link to a smart phone. An app will soon be available to unlock these features. New program No9 “HOT” : “Pro setting” this is a find everything program, based on the Full Tone audio mode with a very low discrimination. Hot is a very interactive program offering excellent feedback and target information. New program No6 “DEEP”: “Pro setting” for locating deep targets, with moderate discrimination and specific signal processing. Improved Non motion / static mode: Non motion modes are now more advanced offering better overall performance, with an improved sensitivity to small targets. 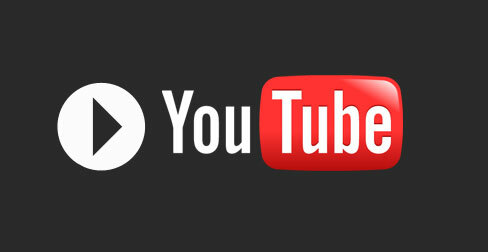 New processing : Faster processing power improves navigation and a range of other parameters. 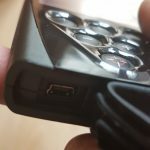 remote and headset battery life has slightly decreased to 18 and 20 hours respectively. 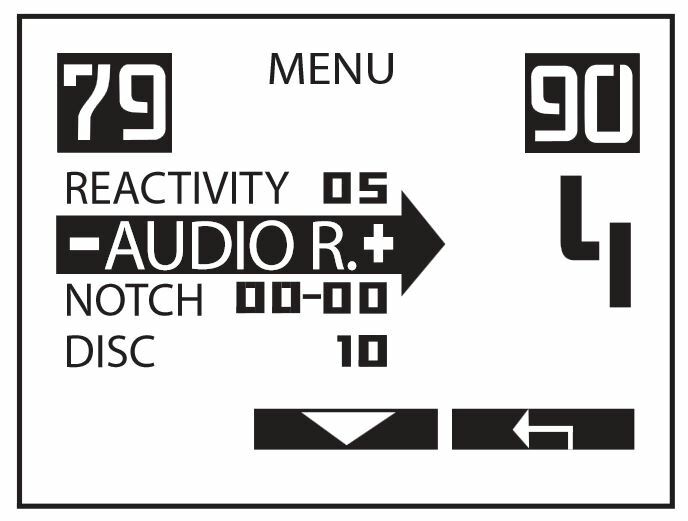 Normalization display is now a menu feature on the WS4 and WS5 headphones. 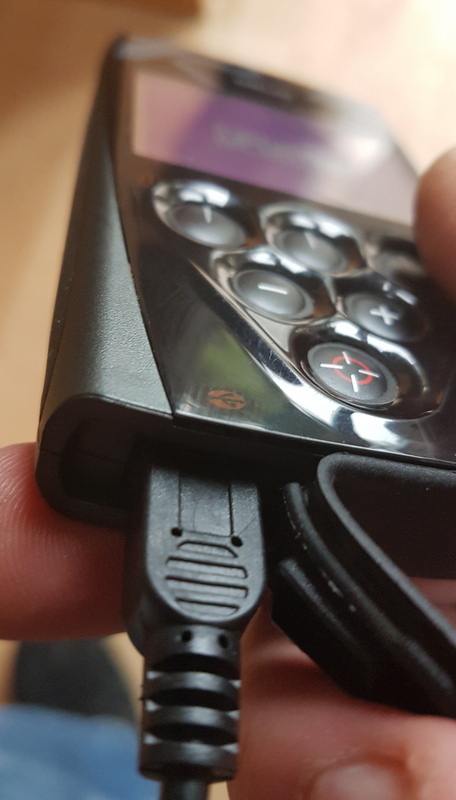 The headset volume is now stored when switched off. The coil name in the coil menu have gone, the serial number is now used as the coil reference. Erasing a coil from the list is done by replacing all characters with 0. The coil charging light is instantaneous, as soon as the clamp is attached the LED lights up. Target Normalization mode is on by default (Normalization is not active with HF coils). Th XY has always been a Deus feature but it’s original form was for factory calibration, this new XY screen is far more advanced. The XY screen provides a visual assistance and may improve the identification of difficult targets when combined with the audio sound. For example: To aid the identification of targets that do not have a precise signature (some ferrous, cans …). Here are some typical target signatures, however certain targets like bottle caps will have their very own target trace. Once is the graphic screen press the + or – keys to select your preferred graphic. There are now 3 graphics to choose from- Once the XY profile has been selected it will become the default display. 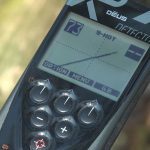 The XY trace has 10 levels of adjustment, access this feature via the pin point button, simply press it for 2 seconds and you will see the Zoom function. At the minimum setting a detected target will need to be quite strong to activate it….At the maximum setting the trace becomes very sensitive and may register EMI as a signal (image on lower right). So try to find a zoom level that suits your requirements. Deus program 9 Hot and Deus program 6 Deep. 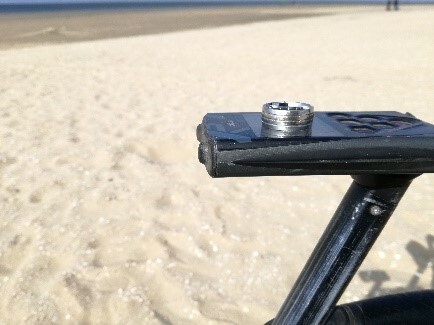 We will have some technical video’s uploaded soon covering the XY screen in more depth. 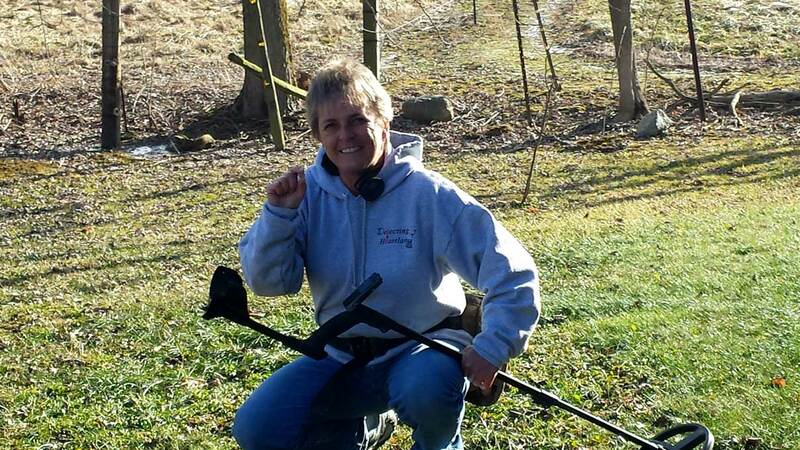 Hi to everyone at XP… My name is Sonya I use an XP Deus and mostly hunt in the Huntingdon Region of Indiana. I just wanted to let you know what your amazing machine helped me find recently. I was out detecting in a field which showed an old home site on my 1866 map. I had been there several times with my AT Pro, and have found some neat relics including a few Indian Head pennies, but not much more in coins. After upgrading to the Deus in October of last year, roughly 3 months ago I decided to go back in November to see if I had missed any deep targets. 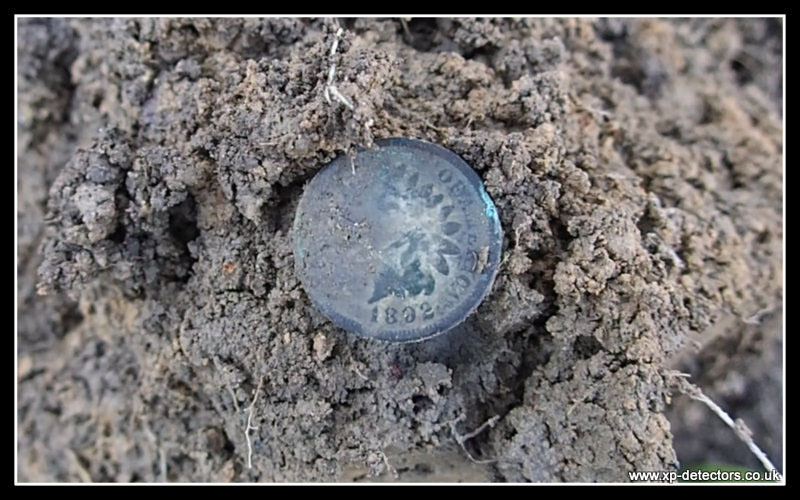 On that day, I found another Indian Head, and 2 V nickels which was really impressive. So eager to test the XP Deus some more I decided to go back again the next day, and guess what !! 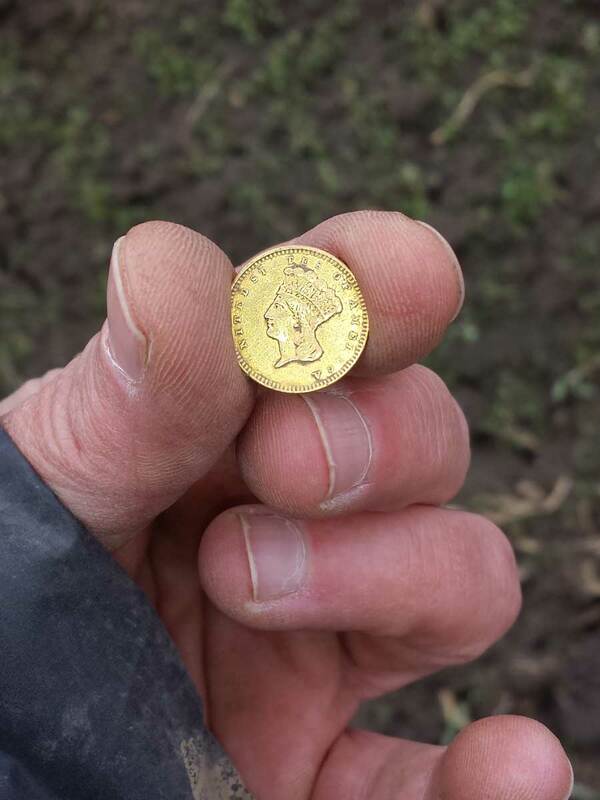 I found a BEAUTIFUL 1857 $1 gold coin! So far this machine continues to amaze me with the way it finds! I’ve only been detecting now for 15 months, 13 of those months have been with the AT Pro which got me 18 Indian Heads, a 2 cent coin, and a shield nickel. So far, in 3 months with the Deus, I have found 6 Indian Heads, 2 V nickels, a shield nickel, a Large Cent, a Seated Dime, a Barber Dime, and of course my fantastic Gold coin. I can’t say enough how pleased I am with this machine. I’m sure as I use it more and learn more about it’s wide range of options and features my finds and enjoyment will continue to increase. I can’t wait to see what I find next! 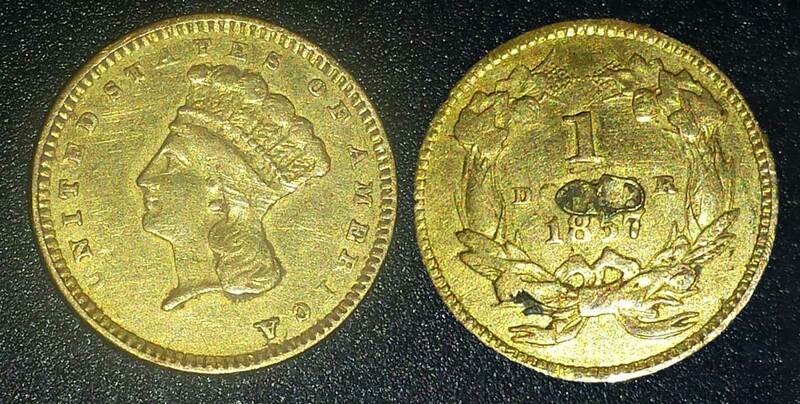 1857 Large Head Indian gold dollars. The coins are are highly valued by coin hobbyists. These gold coins, designed by United States Mint Chief Engraver James B. Longacre, represent the third design type in the gold dollar coin denomination, which spanned from 1849 through to 1889. As 1857 Large Head Indian Princess Gold Dollar measure just 15 millimetres wide, weigh in at only 1.672 grams, and contain a relatively small 0.04837 ounces of pure gold. 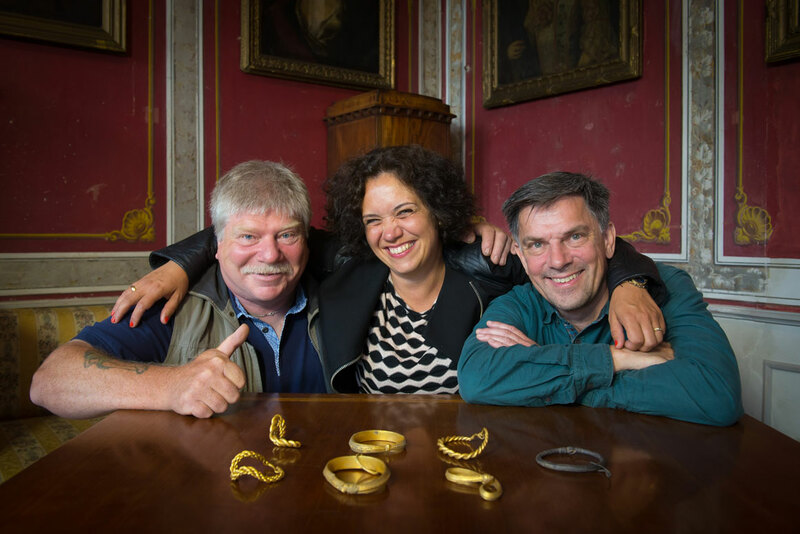 I have had a great year detecting in Denmark with my XP Deus, with 3 items of pure gold, a German gold coin from 1483, a Viking gold pendant and a half gold arm ring from the Danish Iron age period. 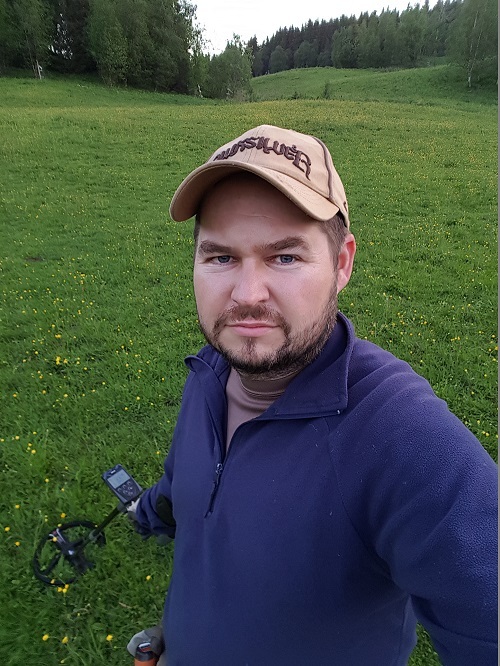 I was going through a very low period with no good detecting finds, so I was eventually forced to change my search areas, after some enquiries I got a permit to search a nearby field next to a old 11th century church. My first plan of action was to hit the field with the Hot program as I had a good feeling about the place and wanted to know the hot spots and area’s of contamination. 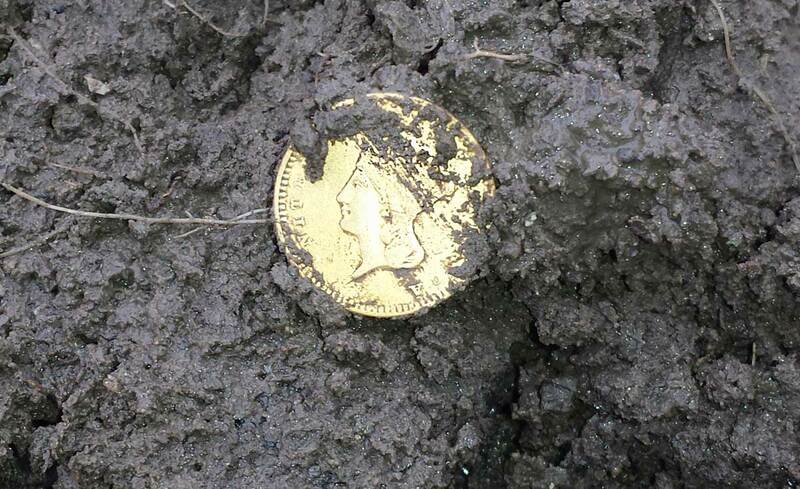 After less then a hour I had found a few coins dating back to 1275 and up, but suddenly I tagged a low sounding signal in the dry ground, my initial thought were that’s foil for sure, a after a little digging I then stood with a lump of soil and could clearly see a gold colour in it, could it be?, surely not !….Bingo ! Yes finally my first Viking gold, from around 650 AD. I am so impressed with the XP Deus I bought a second one for my girl friend. 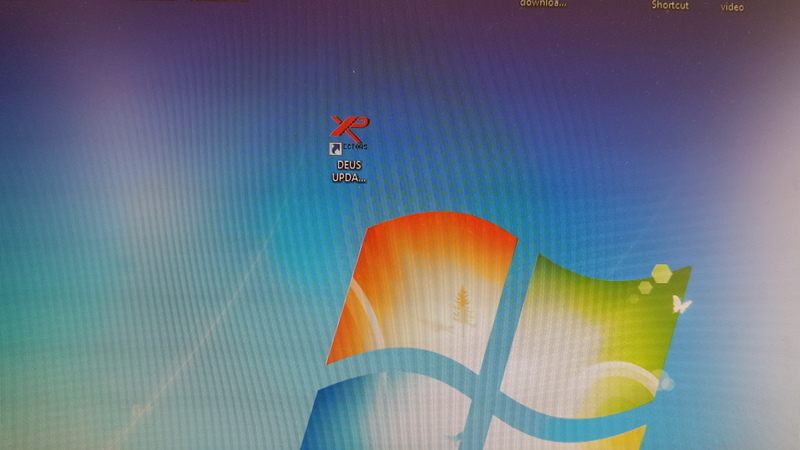 I just want to thank XP for a great machine. 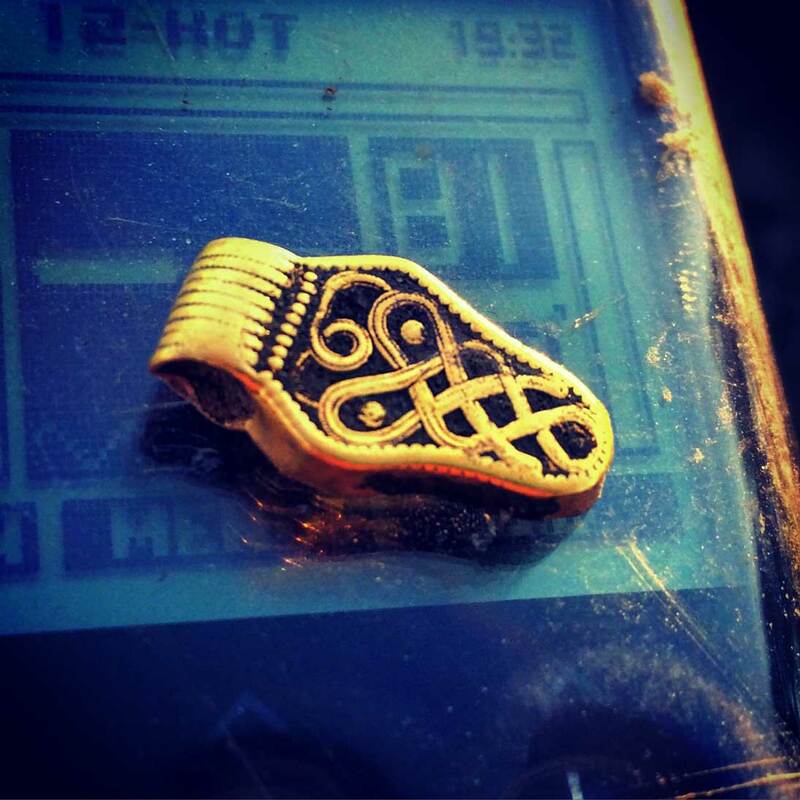 Bronze aged Tutulus unearthed after over 3000 years in darkness. 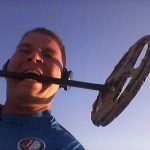 It was late September, 2016 I went out for a days metal detecting on a field I had been working with my XP Deus for several weeks. The 12 acre corn field was surrounded by buildings, which was probably the reason for all the modern junk I found on previous trips. After 2 hours I decided to head back towards my car, and true to form just like many other detecting stories I heard a beautiful signal, sometimes signals sound round and perfect, you just know it’s going to be something good. The target ID hit around 80+ I dug about 12 cm into the gravelly earth to reveal a really strange looking object. I was shaped like a mountain or round pyramid, on the outside the colour was very dark grey, almost black, on the inside was a chalky white. This strange object was rather large, 3.3 cm tall and 3.3 cm at the widest point, and hollow in the middle. The outer edge was missing. I really had no idea what it was. During my drive home the item sat in the passenger seat, I was racking my brains trying to think what it could be, somewhere in my mind I could recall seeing something like this before….But where ? 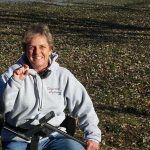 When I got home I switched on my computer and searched the internet, these days you can get an answer for just about anything, it is a perfect tool for metal detecting information. 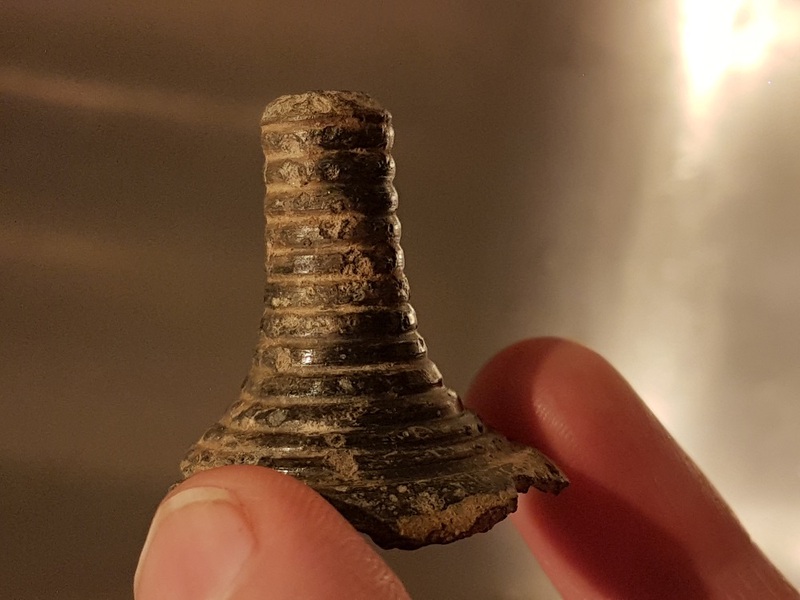 I posted on a Facebook group and it was soon decided this is a rare Bronze Age Tutulus, possibly dating back 2000 years BC. Over the next weeks I went back to the find spot and and 100 meters away found another piece of the Tutulus, the edge even matched. The item was handed over to the archaeologists, it raised a lot of interest because the surface condition was so smooth. 2 months later, I found another piece, this time from the outer edge. There are still pieces from the outer edge missing, probably still in the field just waiting to be found. I have searched this field before and after ploughing now. The program I used was a simple to understand 2 tone, I like simplicity when using the XP Deus, sometimes a bleep dig program can be more effective than a complex custom setting. We are all different and like to hear different things. I strongly believe confidence in a program is a big part of success with the Deus, I always use a 2 tone program based around the GMP, program 2. My special field is now named the ‘Tutulus field’, I am sure this area will reveal more interesting finds now I know the possibilities. So what is a Tutulus ? A Tutulus is not so much an item but an ancient stylistic shape, here are some examples. 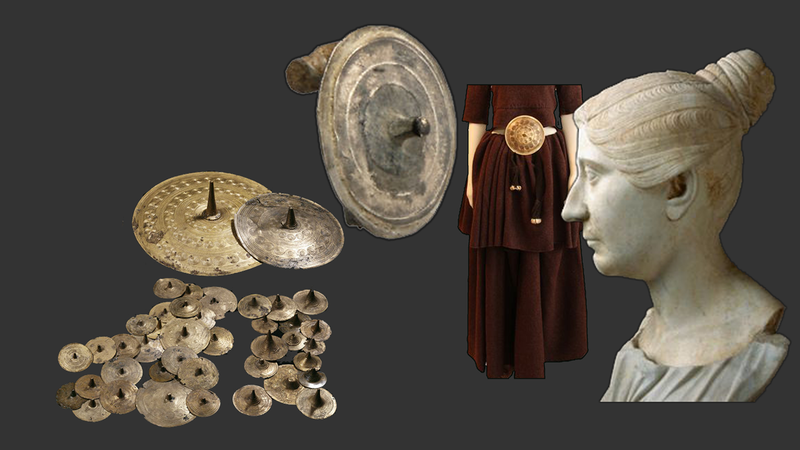 The Tutulus shape can be seen throughout early times, most Roman women’s hair styles were based around the Tutulus, also brooches and artefacts bear the same conical resemblance. 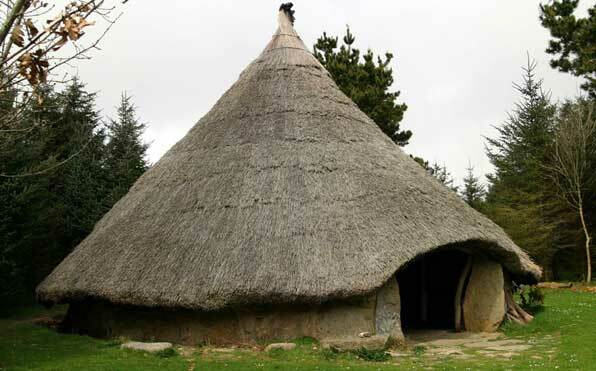 Could this be depicting the shape of an early round house ? You can see how close to the factory pre sets these settings are, however small tweaks can make a big difference. 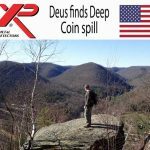 XP Deus USA – This is my story about finding a deep coin spill. Greg and myself were invited to metal detect with a couple of friends (Dave and Joe) from Cameron County, Pennsylvania. I grew up there in a small town called Emporium. I travel back to that part of the state a couple of times a year to visit friends and family, go hunting, fishing, and of course, METAL DETECTING. 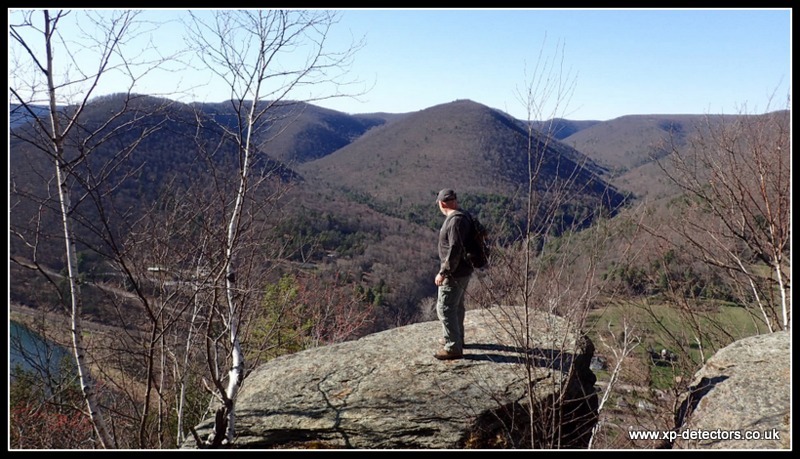 It’s a beautiful part of the state nestled in the Allegheny mountains. During this trip, Dave had secured a permission for us to hunt that included a potential area where an old school once stood, an old hunting camp, and an old foundation possibly dating back to the late 1800s. At first, we all were finding loads modern brass bullets. We all came to the conclusion that a lot of shooting practice must have taken place at the hunting camp over its many years. In addition, we all dug a fair share of hunting camp trash (especially Greg). 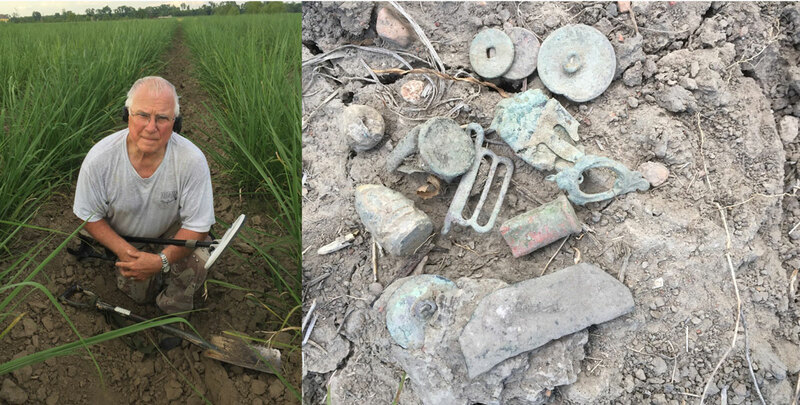 We did end up with some really nice relics which included Greg’s toy car, Dave’s pocket knife, Joe’s axe head, a few buckles, an old rail road key and much more. 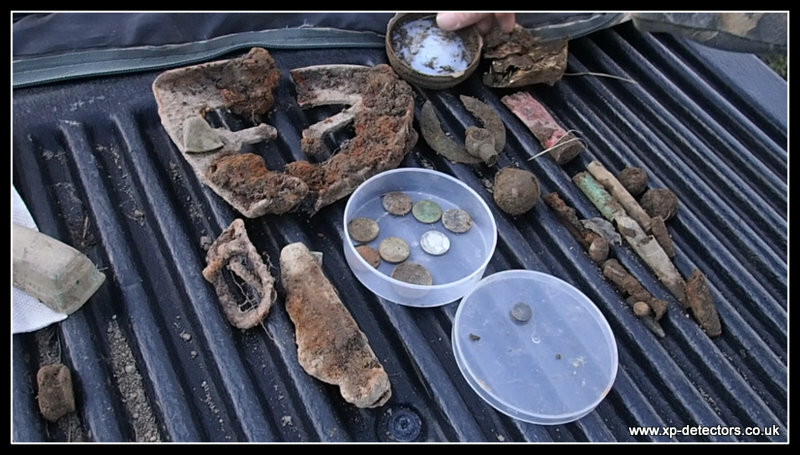 We all found a few coins which included Dave’s 1945 Mercury dime and Greg’s 2 Indian head pennies. But the coin spill really changed the day for me. Like I said, most of us dug a lot of bullets that day and because they contained brass, all of them sounded great. I also tuned up my “Audio Response” to 5 because I like to hear the faint deeps signals amplified and I’m glad I did on this particular day. I came across a good signal that sounded a lot like the other bullets we were digging. However, I wasn’t registering any VDI numbers so I knew it was deep. After getting down to about 10 inches out popped a wheat penny. I was a little disappointed because I was hoping for an Indian head since the coin was really deep. I checked the hole again with my pin pointer and there was another signal and another coin. Then there was another coin and things began to get real interesting. I ended up pulling up 21 coins total from the same hole. It was my biggest coin spill ever. The coins ended up being all pennies but 5 of them were Indian head pennies. The oldest one dating 1892. 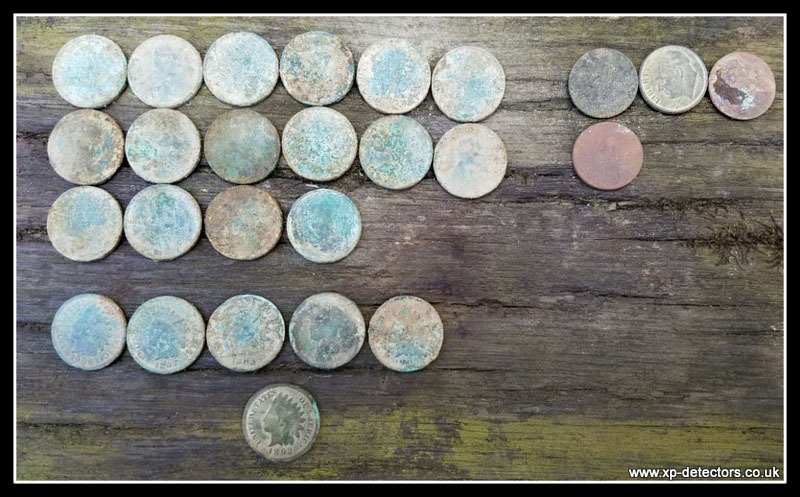 The rest were wheat pennies from the early 1900s but a great finds nevertheless. My other settings include: Iron DISC = 0, Sensitivity = 93, Reactivity = 1, Silencer = -1 (sometimes 0). I had a difficult time ground balancing the Deus at first. I tried to manually set it by “pumping” but I couldn’t find a clean patch of ground so I ended up using “tracking” and watched the machine for a little while to see how it was tracking and then manually switched it to 81. I personally feel that you get a little more performance from setting up your ground balance manually if you can. The XP Deus and Depth. I was super impressed with the depth I was getting on this particular site. Sometimes I read forums and hear people say that the Deus doesn’t go very deep – I totally disagree. It really depends on your conditions and how you have the machine set up. On this day, 4 machines were being used. 2 AT Pros, 1 MXT, and my Deus. The other guys tried to locate the same coins I was hearing and none of their machines could hear the signals. Not even a small blip of signal could be heard by the other machines. We were all pretty surprised and impressed with the XP and the depth it was picking up the coins. Clearly, the XP Deus had the advantage on this adventure. Great story Scott…..Thanks for sharing. What is the deepest program for the Deus? How do I go deeper with the Deus? I have based this article around these 2 questions they sound similar but are very different! Part 1 What is the deepest program for the Deus? Based on my experiences there is no single program to go deeper for everyone, there are too many factors to take into consideration. A deep program may work on one persons land but may be very unstable on another’s. Some deep internet programs simply have higher sensitivity levels and the audio response turned up, this will not make the machine deeper, it will only boost the audio level on smaller targets and higher sensitivity levels can make an erratic operation. Deep targets will sound small, so a smooth running machine is essential or you may miss a deep target thinking it is a false signal. XP have designed 10 factory pre-set programs to give good performance and suit most world wide search scenarios…rest assured they are working on new adaptions all the time, your factory settings may very well require tweaking to enhance the performance on your site, or to make your detecting experience better suited for you. 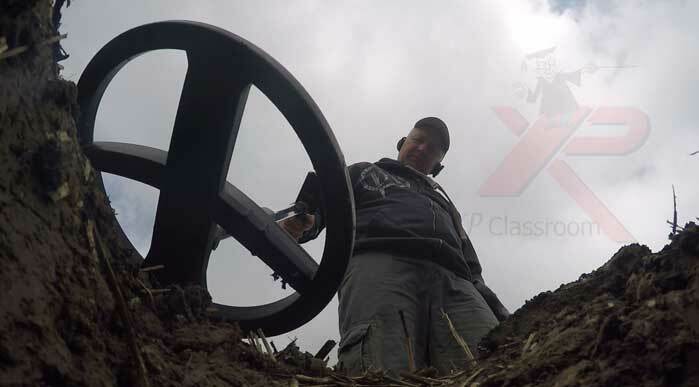 Soil conditions and desired targets change all over the world, if you want a true deep program it must be designed for your site and most importantly your abilities. Very soon in this article you will hear me mention the terms Auto Mode and Manual Mode, bear with me all will be explained. Before you decide to go out and hunt for deeper targets perhaps it may be wise to ask yourself “what are my desired targets”, deep singular coins or deep hoards, as the machine may need to be set up in different ways. As a rule of thumb site conditions dictate depth, mineralisation, heavy stones, iron contamination and regularly turned soil just to mention a few, can all greatly reduce a machines performance. Be aware that the target signal can change from good to bad in a matter of centimetres. Suspicious signals are very often the result of ground consumption, as the target gets deeper, the ground saturation gets stronger and stronger until finally the target gives no response. Area’s with high mineralization will consume the target much quicker. No matter what machine you are using, searching difficult soils very rarely yield deep targets – That’s my excuse anyway. 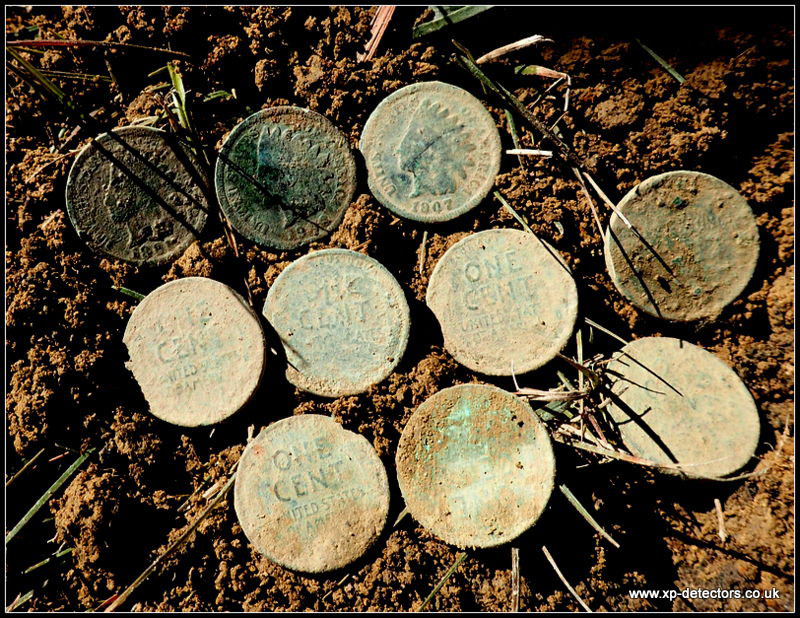 Some sites may simply have no deep targets present…you cant find what’s not there!…however if I were to be searching for a buried hoard I think my best chances of success would be to start searching on a quiet site rather than a busy one. Back in the day people would bury treasures somewhere quiet, not in the middle of a settlement, unless under the floor of a building I guess. 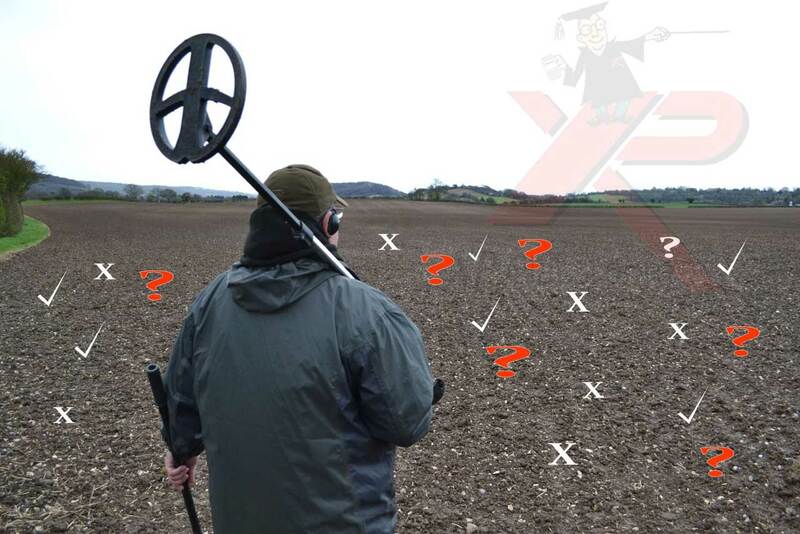 Some overseas detectorists only look for hoards and large treasures in remote area’s, they are not interested in small targets and do not care if the target is ferrous or non ferrous. They very often choose XP Deus settings that complement the larger coil. 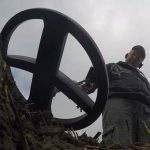 Popular settings are based around the All Metal or in case of mineralised conditions the Goldfield program, using the lower operating Frequency 4 kHz a slow Reactivity 1, Silencer at -1, and an accurate ground balance by using tracking or pumping. Detecting in manual mode will always give a further advantage. Naturally small targets will never be found at great depths but they can be found at impressive depths using a higher frequency and manual mode. 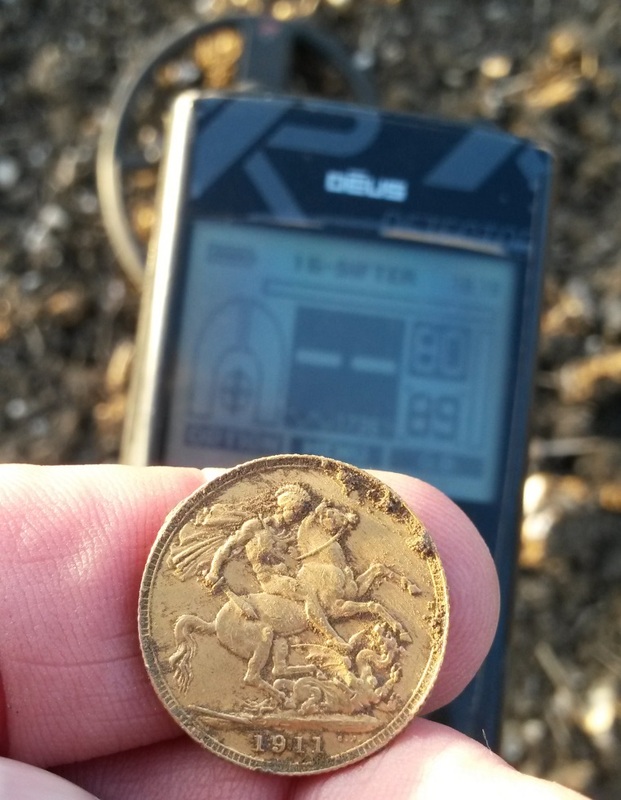 This Gold coin was found by investigating a signal that I would normally ignore. Part 2 How do I go deeper with the Deus? Let’s assume you have the best settings for your site and you are confident the machine is working to the best of your ability. So how are you going to play it ?, like you normally do or are you going to try something different, remember you are specifically looking for deep targets, so what needs to be changed ? 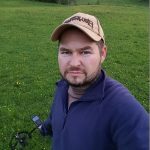 I truly believe switching from Auto to Manual Mode will give you the desired results, many detectorists out there are using manual mode with great success, have you ever wondered why some people in your club or group are constantly getting good results….Because they are in manual mode. What is Auto and Manual Mode and how do I find it in the Deus menu? It’s not in the menu, it’s in your head and your attention to signal detail….9 times out of 10 when I run a Deus 1 to 1 session the clients are in Auto mode, they don’t realise it because that’s all they know. By the end of the session they are all in Manual Mode this is because they have been shown and understand the grey area’s of the Deus audio signature, and have a vastly improved search sweep. Everyone has the ability it’s simply learning the Deus language and exercising a little patience while searching. 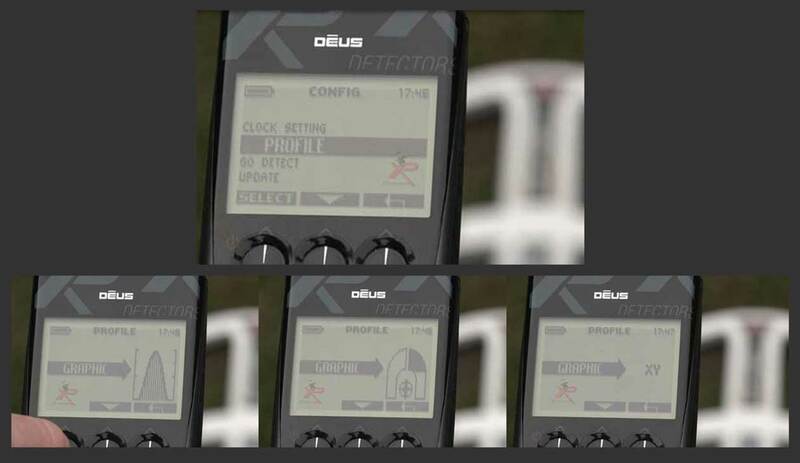 Not all detectors talk the same language, I truly believe the Deus is in a class of it’s own. I think it is so sensitive to small changes in soil and target composition, it reflects in the audio sound. This is not a bad thing, but to get the best out of your machine it requires a little understanding. Let’s take a modern digital camera, most have 2 modes Auto and Manual, personally I can not take a good picture unless it’s in Auto, there’s no shame in that, its how I get the best results. However I know if I took time to learn the camera and then used the manual mode my pictures would be far superior. The difference between Auto and Manual mode is your state of mind, the question is how far are you prepared to go? The more you put into the Deus the more you will get out of it. Lets assume you are new to the Deus or just prefer an easy day, the factory pre-set Basic 1 offers a good choice, feedback is limited but it’s a great beep-dig program and fun to use. Because it utilises a higher discrimination with no iron tone the user is only drawn toward digging good sounding targets. The Deus has what I call a grey area, this the point where the target is neither good nor bad and more often than not this gives the deep target signature, Some describe it as a junk signal, I like to describe it as an audio question mark, all fields are full of audio question marks ! 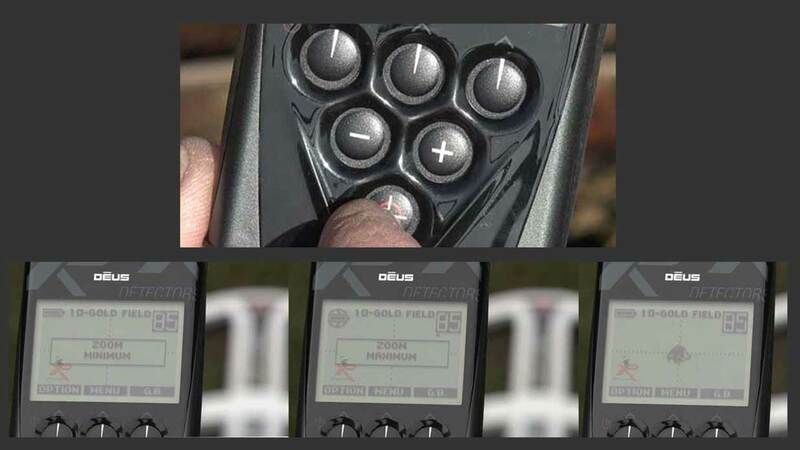 It is probably not a good idea trying to investigate loud suspicious signals, they will most probably be iron, providing you have the Audio Response set correctly the smaller deeper targets will be very obvious by the softer sound, 3 or 4 are popular settings. Good signals are good, Iron signals are bad, anyone can deal with those, but it takes extra patience and skill to deal with the suspicious signals. And this is where learning your machine is vital! Using a more dynamic program, such as Program 3 (Deus Fast) and changing to Full Tone with 0 discrimination, can increase the feedback from the machine and those grey question mark area’s will be far more noticeable. For those who prefer a single tone, Deus Fast and simply switching to Pitch mode does a pretty good job. Manual Mode is a real confidence method and you will need patience, OK you will get caught out on a few pieces of deep iron, but I guarantee once mastered you will find good targets at impressive depths. 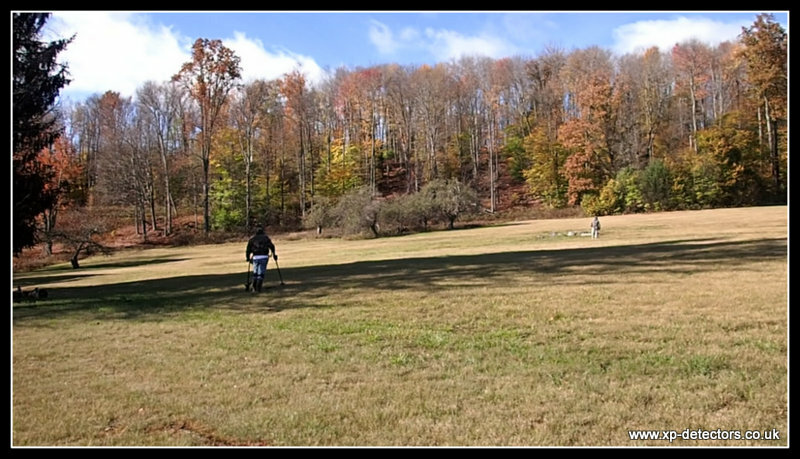 This video shows how easily the ground can contaminate a good target. As the target becomes saturated by the ground, the iron tone creeps in. This is why using the Audio response is so important, if you can hear a target is deep, you can then better evaluate whether to dig or not to dig. 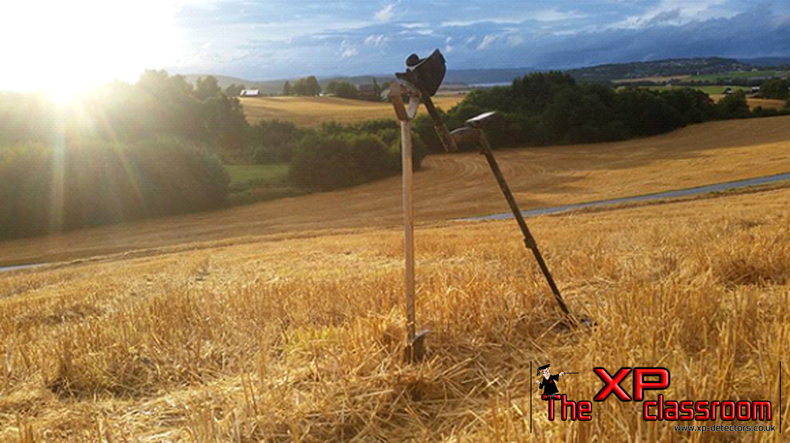 The XP Deus is a very sensitive and deep metal detector in the right hands, be brave and investigate suspicious signals if they are quiet.